Olympic and Paralympic athletes turned out for Newport Heights Elementary School’s jog-a-thon fundraiser Wednesday morning in Newport Beach. 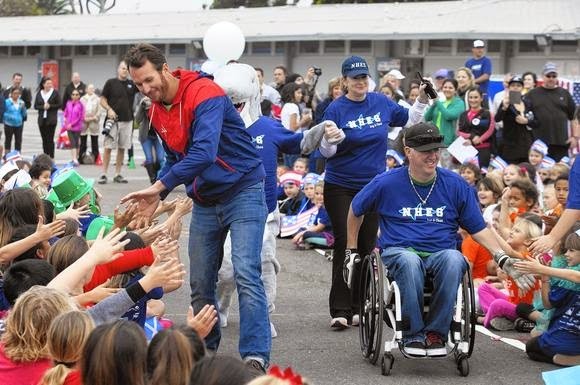 Aaron Peirsol, a five-time Olympic gold-medal swimmer and a Newport Harbor High School graduate, and Brent Poppen, a bronze medalist in wheelchair rugby in the Paralympic Games for disabled athletes, led students in the jog-a-thon’s opening run. Students raise money by requesting pledges for each lap they run. The event is Newport Heights’ biggest annual fundraiser. Last year, it raised $30,000, PTA vice president Janet Montgomery said. The money goes toward classroom supplies, physical-education equipment, school assemblies and field trips. Similar jog-a-thons are held at schools across the Newport-Mesa Unified School District. Jazmin Cervantes, a fifth-grader at Williams School, stood in front of about 90 of her peers and bent her right leg — a request from a guest speaker talking to the group Friday. 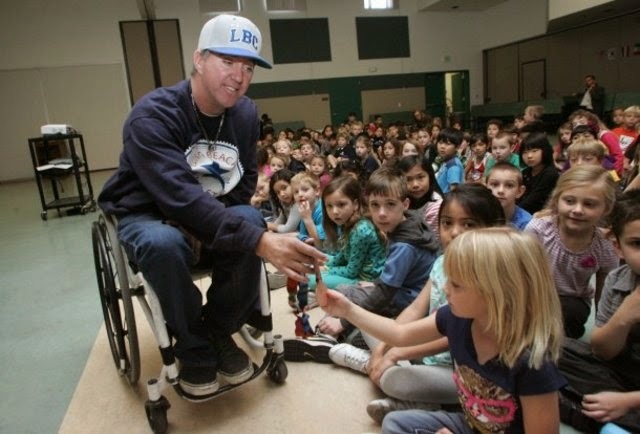 That speaker, Paralympic athlete Brent Poppen, is making his way to about 17 schools in the Bakersfield City School District to share his story. 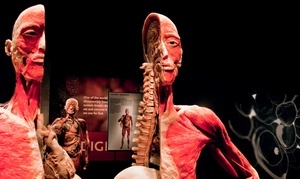 He picked Jazmin, a nervous volunteer, to help him demonstrate the function of a spine. Poppen, a baseball and football player at the time, was paralyzed after sustaining a spinal injury while wrestling at a church summer camp he attended when he was 16-years-old. For the most part, the Long Beach native had only ever been told yes. Yes, he could go to college. Yes, he could play college sports. “After I got hurt, those same people who said ‘yes, yes, yes’ flipped the switch and said ‘no, no no,'” he told the fidgety and talkative group of students. They listened more intently as Poppen continued. He told the group how he accomplished his dreams and went on to become a two-sport Paralympic athlete, winning the bronze medal in wheelchair rugby in 2004 in Athens, Greece, and competing in wheelchair tennis in 2008 in Beijing, China. His goal is to attract more districts to an initiative he calls Team HUGS, Helping Us Give Strength. The motivational speaker, also a rehabilitation counselor at Valley Children’s Hospital in Madera, commutes about two hours from his home in Paso Robles to work with children, and mainly their families. It’s the parents — like his own who blamed themselves, asking why they let him go to that camp — who need him. Poppen said his family and friends helped him get through trying times. 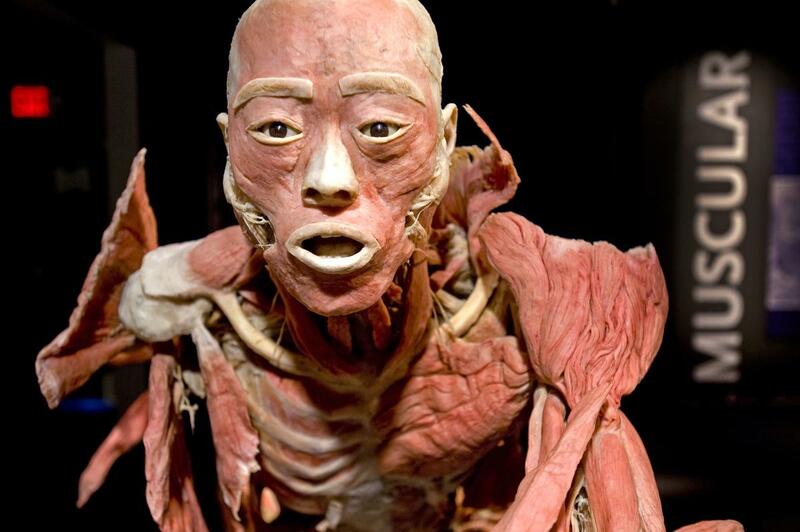 After his wrestling accident, Poppen came within days of losing his life to a blood infection he stubbornly ignored. His sister brought him to the hospital. Reminding at-risk children they have a support system is part of what Poppen does through Team HUGS. He’s visited hundreds of schools sharing what he’s learned, that there’s always hope and the possibility of beating adversity. It’s a message that doesn’t come cheap. Poppen’s daily rate is $750, but he gave BCSD a discount. “I have a soft spot for these kids,” he said. Briana Alvarez, the afterschool coordinator at Williams School, also used part of her budget to buy 10 of the author’s books for her students. “We have a lot of students who like to pick on other students,” she said, hoping Poppen’s message would resonate with her group. “I’m hoping they will be inspired to reach their goals in life or just in school,” Alvarez said. Poppen said it was a tall order, but his hope, too.